A warm beautiful oil lamp light starts with the right wick. Oil lamp wicks absorb and transport fuel oil to the top of the burner for combustion. Without oil wicks that fit properly the promise of light falls short. Most wicks are 100% cotton wicks made in the USA; unless otherwise noted. Search our quality lantern wicks by width and type below. All wicks for oil lamps ship for free. Flat and round oil lamp wicks for kerosene lamps are listed by width. Shop tiki wicks for tiki torches and oil candle wicks for olive oil lamps and making candles. Selecting the proper wick for your oil lamp is easy. Measure the width of the old wick: the easiest way to find the right wick. Or measure the wick channel, as shown in the photo below. Just pull off the top of the burner to get to the top side of the channel. If the top does not remove, flip the burner upside down and carefully measure the bottom side. You want to mindfully measure the width of the wick channel. It is better to go with on a slightly smaller width. A slightly smaller width will still fit the burner, where a slightly larger width will not. IMPORTANT: As a general example, do not assume all #3 size burners use the same wick. For the last 160 years, different manufacturers have labeled burners according to their fancy. There were no and are no industry-wide standard dimensions. So please, just measure the burner, it's easy. Length of a lantern wick or oil lamp wick can be summed up pretty quickly; a little too much is a lot better than not enough. If the replacement wick cannot reach the oil it will dry out and extinguish itself. An 8 inch wick will last through about 15 gallons of lamp oil (that's enough wick to burn 24 hours a day for 320 days). Consider this: The distance from the top of the wick to the fuel, for any average oil lamp or lantern, is 6 inches. If you purchase a 7 inch long wick you only have 1 inch of wick to burn before it's too short to reach the fuel! We like to cut and use 8 inch long wicks. In this example, purchasing a 8 inch wick significantly extends the wick life. Plus, it's easy to trim wicks. Read how to trim wicks here. Wicks for oil lanterns are often a thinner, very tightly woven wick. Thinner wicks do not get easily tangled in the star wheel wick raiser of the lantern burner. Most antique oil lamps and newer varieties have a burner for thicker wick. Nevertheless small oil lamps or those with delicate small burners can require a thin wick too. The good news is the thickness of wicks differ only slightly. If you're having a hard time rolling the wick through the burner - and if the width is not to wide - then you need a thinner wick. The table below provides the general range of wick thickness in inches and millimeters. Less than one millimeter is the difference between the biggest and smallest wick thickness. Most of our wicks are of medium thickness and will have no problem fitting a lamp or lantern of proper width. *Wick thickness for oil lamps and antique lanterns are for general purposes only. This information does not apply to all styles of lamps and lanterns. The best way to find the correct size wick is to measure your burner. Remove the old wick from burner and discard it. Insert the wick into the underside of the burner and use the wick adjustment knob to thread it through. If you're having problems try using some tape on the end of the wick before inserting it into the burner. 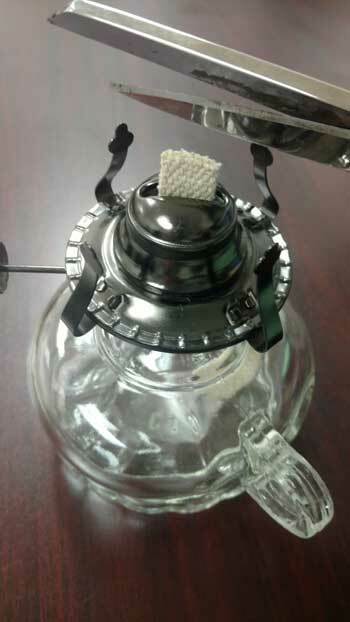 What's the difference between flat wick and round wick lamps? Round wick lamps burn a wick that is threaded through the burner in a circle or semi circle. Round wick lamps increase the burning surface area without increasing lamp size. 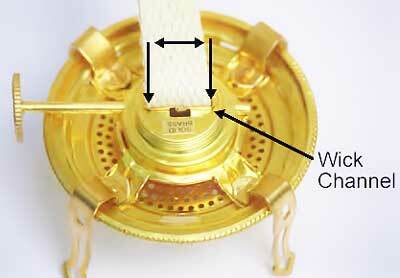 Round wick lamp wicks have a larger width because they are bent into a circle to use. Flat wick lamps thread a flat wick through the burner assembly. The range of oil lamp performance ranges from 8-100 lumens. In this range center draft round wick lamps shine three to four greater than flat wick-type lamps. The oil lamp era was fun - If you liked to trim wicks. Before electricity most American homes were lit with oil lamps. A boy could become an artist in trimming a wick, stepping back for perspective, clipping a smidgen here, turning the wick up just a trifle there, creating brightness for the night until his grandma told him to stop dawdling. Every time an oil lamp or lantern is burned the wick should trimmed to maintain optimal function. Trimming the wick is a very important step in lamp and lantern care. When done properly better light and lamp enjoyment will result. The black carbon combustion by-product builds up on the tip of the wick after each use. Trimming the wick, if you're dependent on oil lamps for lighting, is an everyday process. To keep oil lamps in good working condition the tank should be kept full and the chimneys should be washed. Proper wick trimming will provide much better light and general satisfaction. Wick trimming is an art. The more you experiment the better at wick trimming you become. Still, it is an easy art even for beginners. You need a sharp pair of scissors. Your goal is to simply trim the char off the wicks after each use. You'll have to clean the chimney much less and your fuel combustion will be cleaner. Careful! Even after the flame is out the chimney can remain hot for an hour. The photo above explains tick trimming techniques. One can cut the wick perfectly straight across; the resulting flame will be broad, flat and rounding at corners. Some wick trimmers cut the corners of the wick at an angle, making a triangled point. Wicks can be trimmed rounded or in a double point. You can trim your wick in any way you prefer. This slight adjustment may improve the shape of your flame - give it a try! Remember the key to proper wick maintenance is to be sure the wicks are always properly soaked in the lamp oil (Never burn them dry). With moderate wick burning and never letting wicks get dry, you'll not have to worry about running out of them. As long as your wick is wet with oil, the oil is what is burned, not the wick. Do not buy specialty candle wicks for making small string, rope wick candles or olive oil lamps. 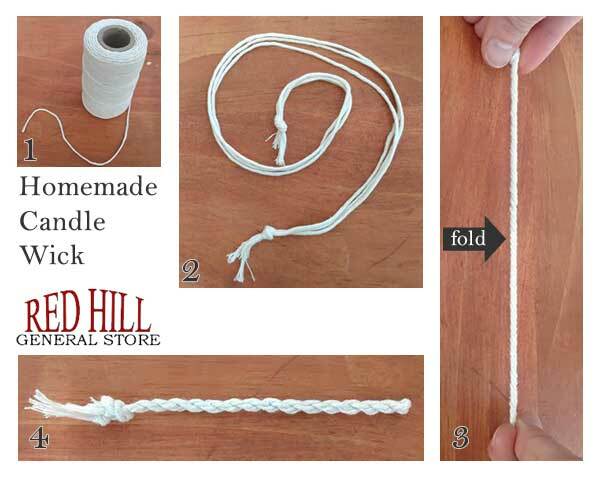 It's easy to make your own homemade candlewick! To make candle wicks you will need: any 100% cotton string or twine. We stock affordable basic cotton string for oil candle wicks (pictured below) and sturdier rope oil candle wicks or you can find it in virtually any hardware store. The thicker the string, the larger the candle diameter and the more light the candle will provide. Here are two methods to make oil candle wicks and a boric acid treatment to extend wick life and enhance burning performance. Gather enough strands of cotton string to equal 1/2 the thickness of your finished wick. Tie the ends of the small strings together. Holding one tied end in each hand, twist on one side until it starts to kink. Use your teeth to grab the center of the string and fold in half. The string will twist around itself. Smooth the string from the center towards the ends as you fold. Knot the ends together to keep the wick from unwinding. Learn how to make an olive oil lamp. Try making a wick with a cotton q-tip. If you have a cotton q-tip you can forget the wire! It burns quite slowly so a little goes a long way with olive oil lamps. Twist cotton end until it falls off the stick. Shape the cotton tip into a teardrop. Float the teardrop in olive oil and light it! Read more about burning olive oil in a lamp here. Just add one tablespoon of salt and three tablespoons of Borax per to one cup of boiling water in a pan. Use a rock to weigh down the cotton string so the boric acid solution covers it. Let it soak for several days (at least 24 hours).Remove cotton wicks with tweezers and hang to dry in the sun. The wick can be coated in wax or used in an oil candle or olive oil lamp. Red Hill General Store carries a complete selection of oil lamp and lantern wicks. 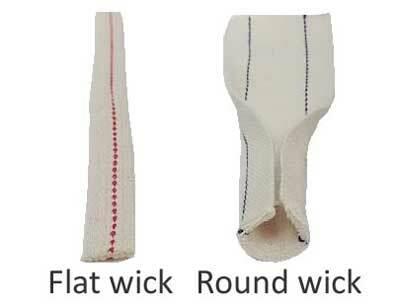 Find flat wicks and wicks for round wick lamps. From the oil lamps of family heirlooms and the yard sale finds to cold-blast lanterns factory new, we carry all sizes of wicks for oil lamps. If you live near the Blue Ridge Mountains of southwest Virginia, visit our store in Hillsville and bring your lamp burner to make sure you leave with the right size. 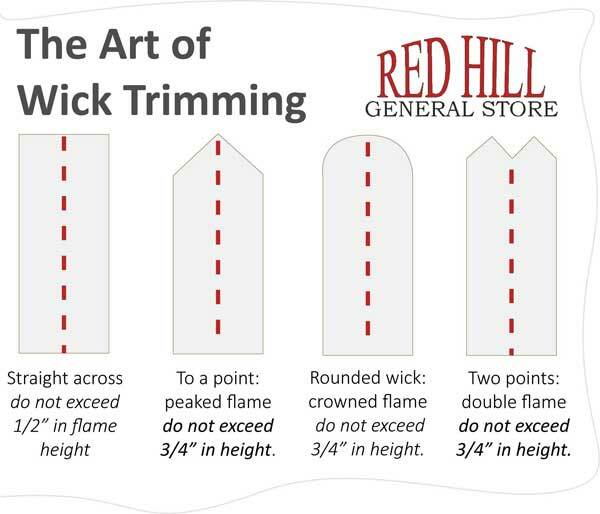 It's easy to measure your lamp burner or even your old wick (for round wick lamps it is easiest to measure the wick) to find the proper wick width replacement.